Villa Voyage is five-bedroom villa which is located on absolute beachfront property in the idyllic tropical island setting of Nusa Lembongan. This five-bedroom villa boasts gorgeous sea vistas, glamorous ‘luxe nomad’ themed interiors, gourmet cuisine, and professional staff focused on spoiling their guests. Farah Khan, whose fashion creations are favoured by many Hollywood celebrities, has styled Villa Voyage as a barefoot luxury abode, while maintaining the old world charm of coconut-wood floors, bamboo, thatched alang-alang roof and driftwood lamps in a tropical island setting metres from the white-sand beach. Space and freedom abound in the contemporary interiors, with comfortable sofas and tables crafted from reclaimed limed teakwood set before walls of glass framing the sea view beyond the deck. Accenting the neutral colour palette are couture designer touches and decorative flourishes supporting the glamour travel theme – vintage Louis Vuitton monogram steamer trunks; Prada, Tods, Aigner, and various other designer luggage. Amplifying the luxury safari look is canvas and leather furniture from the Esprite Nomade collection, including their renowned bespoke tents that float over Voyage’s supremely comfortable beds. Inside Villa Voyage guests can expect to be cosseted by the villa’s charming staff, and beyond the villa walls Voyage keeps true to its adventure theme by providing a luxury buggy for arrival and departure transfers and a private jukung outrigger for snorkelling, beach-hopping and round-island cruises (extra charge applies). 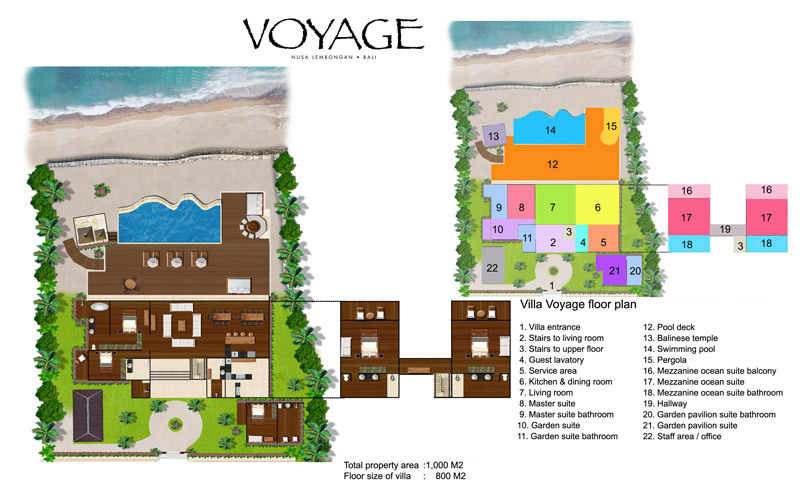 As a designer beach retreat, Villa Voyage is incomparable. It is particularly suited to couples, groups of friends and extended families, and will be appreciated by lovers of design aesthetics and effortless chic. This beautifully designed luxury beachfront villa is set on the crescent of Sandy Bay in Nusa Lembongan, 30-minutes’ boat ride off the east coast of Bali and was created as a luxury beach home for couples, groups of friends and extended families. Guests arriving in Bali late afternoon or evening should arrange overnight accommodation in Sanur and ferry transfers to Nusa Lembongan the following morning as sea crossings after 5pm are not recommended. A complimentary buggy will meet guests at Mushroom Bay on Nusa Lembongan for transfers to the villa. Below, the master suite continues the ‘luxury under canvas’ theme, with a four-poster queen bed bedecked with canvas and leather trim, a steamer trunk acting as a media cabinet for the flat-screen 40-inch TV, a canvas seating area that conceals a spare bed, and canvas-backed directors chairs set before sliding doors delightfully opening onto the pool deck. Beyond the bedroom is a dressing area lined with leather-trimmed rattan clothes storage and shelving designed to accommodate the most profligate packer. This leads into the bathroom with double basins, patio with open-air shower and, taking pride of place before sliding doors to the beachside deck, a sculptured terrazzo bathtub. Each of the two identical and enormous mezzanine ocean suites expresses the villa’s luxury tented safari theme to perfection; a queen-size bed is cocooned under a floating canvas tent suspended from the apex of the alang-alang roof, and the rooms are furnished with wardrobe ‘tents’ in the dressing area, a folding writing desk, day bed, and steamer trunks. Coconut-wood walls and floors continue the rustic–luxe look, and large Pucci print cushions add a dash of blue to the otherwise neutral palette of browns and creams. A soaring triangular wall of glass to the front opens onto a large private ironwood balcony furnished with a round table and chairs and a pair of sun loungers and stunning sea views. To the rear of the bedroom, cunningly concealed behind screens of canvas, is a large open-plan bathroom with double basins and mirrors and glazed terrazzo enclosure with rain shower. Next door, facing away from the sea, is the garden suite. The contemporary four-poster bed laden with colourful cushions faces a small courtyard and, on one side, a balcony with table and chairs. A particular feature is the traditional leather travelling desk which doubles as a dressing table. The large ensuite bathroom has a wardrobe of rattan and leather, double basins and, set in a sun-filled patio, an open-air shower. The garden pavilion suite stands alone, surrounded by white sand in the villa grounds. Its’ harem-style silken ceiling calls to mind Bedouin tents and desert hospitality, and such romance continues in the soft furnishings and decorations. Walls of glass offer glimpses of the sea and lead onto a private deck. The ensuite bathroom is discreetly tucked around the corner of the walled garden deck. Villa Voyage’s magnificent living room is open-plan for easy entertaining, its walls of glass doors leading onto the pool terrace and highlighting the stunning tropical beachfront setting. (The doors fold back completely for open-air sea-breeze living, or can be closed to create air-conditioned comfort.) Within the double-height central section, four over-size cream upholstered sofas are arranged around a sectional coffee table set before a console with 60-inch LED TV, Apple TV, DVD and iPod. The owners’ exquisite taste and design influence is everywhere: Louis Vuitton trunks provide voyage-themed displays; Thai, lacquer ware offering bowls provide red accents and richly scented candles tease the senses; lavishly illustrated books on Balinese customs, exotic travel and the best of international interiors engage the mind. Above, a halo of over-size canvas lampshades lures the eye towards the mezzanine gallery – noted designer, Ari Saski Wekku, also created the cigar-shaped driftwood statement lamp over the entrance. On the far side of the living pavilion are two dining tables of reclaimed limed teakwood, each with six canvas director’s chairs. An island of teakwood and marble acts as buffet, bar and cooking station for when guests wish to whip up a gourmet meal themselves. Behind is the chef’s kitchen, equipped with everything required to lavishly entertain 20-plus people. Bridging the pavilion and the beach is an huge ironwood deck overlooking the turquoise waters of Sandy Bay, with a 12m x 5m free-form tension-edge pool big enough for swimming laps yet with a shallow platform for relaxation. Equally evident here is the exquisite attention to design detail found within the villa. Poolside beanbags, sun loungers and daybeds invite indolence, and a shoreline pergola provides shade for two defined areas: an over-size daybed platform inches away from the beach for sea-breeze siestas and sunset cocktails, and semi-circular seating curved around a teak table laden with shells – the perfect spot for a leisurely breakfast. Stylized animal-print cushions add just the right touch of glamour, and at night the area is transformed by clever ambient lighting that illuminates the palms and bathes the pool in changing colours. A few steps down from the deck is a sand garden where offerings are placed daily at a Balinese temple tucked under the canopy of a sacred banang-banang tree; shaded beneath its bowers is an antique daybed and a few paces away a gate set in the low dry-stone boundary wall leads directly onto the beach. 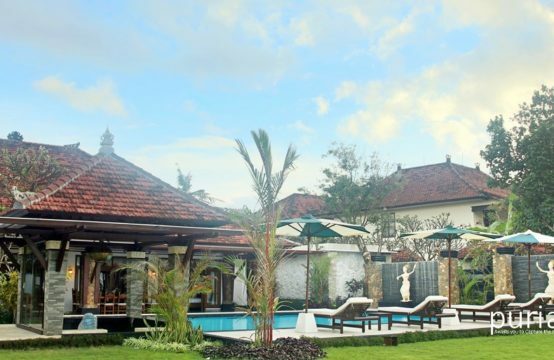 Villa Voyage capacity for 10 adults (in 5 queen-bedded rooms with ensuite bathrooms). Two daybeds can be used as extra beds and one additional bed can be made available on request for a small extra charge. Double height open-plan sitting room; indoor dining for 12; outdoor dining for 10 in gazebo; pool deck with multiple seating. Villa manager; operations manager; chef; butler; 2 housekeepers; gardener; pool attendant; guard providing night security. Masseuse, spa therapist and babysitters – extra, on request. A wide variety of Western and International dishes. Suggestion menu. Requests accommodated (including special diets). WiFi internet access; printer available for guest use. iPod plus docking station; 60-inch flat-screen LED TV; Apple TV; DVD player and movies; books; games. Wall-mounted speakers with volume control for both inside and out. A luxury buggy is included for arrival and departure transfers and can also be rented at other times (extra charge) also included is a private jukung outrigger for a one time 3 hour trip and can be rented at other times (extra charge).